A New Look For A New Generation! You don't need a new shape, style, or size to create a new poolscape. A stunning makeover is as simple as replacing your interior pool finish. It's simple, affordable, and usually just takes one day to complete. 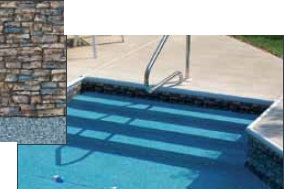 Choose from our many beautiful patterns and enjoy your remodeled, revitalized new pool! Handcrafted Quality– Our computer drafting precision ensures an exacting fit for any pool shape. Vast Selection – Explore all the patterns available to you and see how there's an interior pool finish for every taste. Watertight Protection– Our patented faceplate system creates an impermeable compression bond seal between your stairs and your interior pool finish, providing years of carefree enjoyment. 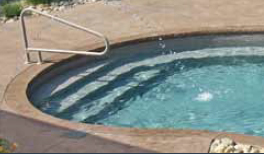 New Entrance System Opportunities– Refurbishing your pool’s interior? 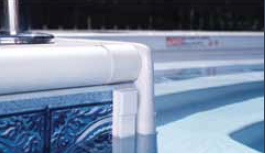 There's no better time to enhance your swimming experience with a new bench step, sun deck, cove, or other entrance system! Choose from our many options of built-in stairs or Tread-Loc™ Steps, or design your own!